Welcome to the Marketing for Owners podcast, where we teach small business owners just like you, just like me, how to develop a marketing strategy and system to bring in more customers for less effort. And customers that make better profits, by the way. It’s all good, so stay with me. Today we are talking about surveys. Why do we need them? Read on to find out. . . 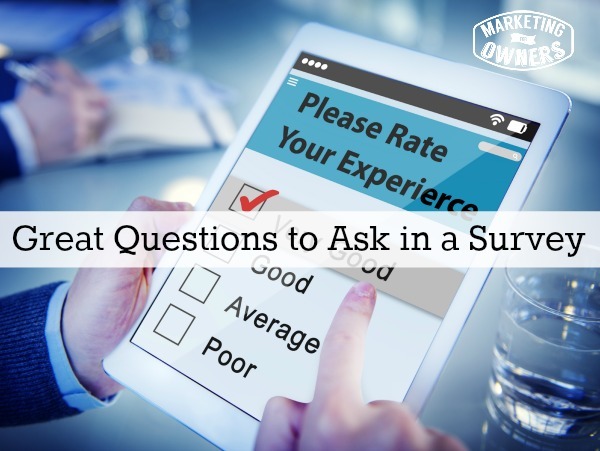 Surveys are essential for your marketing system and pretty much for anything in your business. In our 5 P’s of Modern Marketing, the second one is potential. We only want to market to people who have the potential to be customers who could possible become a customer. We need to know who they are and we need to know more about them and we need to know what they want. We don’t want to know who they are for when we just give them what we want to give them. We still want to give them what they want. Now, the way to do that is with survey. Asking questions in survey is not difficult but there is a little science to it because we’ve all had long, boring, page after page surveys that we just give up half way through. We don’t want that. So we want to keep it short, straight and to the point. Now, another example, another reason for asking a survey is it can help lead to a product or something new that you’re doing. I’ll give you an example — say that you are refurbishing your restaurant, or you’re developing a new menu for your restaurant. You don’t want to wait until you’ve done it and then survey people. You want to survey them in advance to get people’s input. And the best people are customers. So hopefully you’ve been building a list in an email list. Again, we’ll come to that in a minute about if you have got enough to ask. You want to ask them questions that find out what they really think, you want to find out what they would like in an ideal. And you want to find out how they work things, what language they use because if you can ask some questions where they have to write an answer–I’ll explain that in a minute–then they will give you their language, their word. So for example, I’ve refer to people as customers. Other people may refer to their customers as clients. That’s good to know. Language is important because if you’re using words that are inside your customers head then you’re half way there. What are the good questions to ask? First of all, avoid the fluff. If it’s not necessary, it’s not necessary. Like for instance, do you really need all that demographic info? Do you need to know they keep fit or ride a bike? How does that help? Don’t bother with all that. Do you really need to know how old they are? You might need to know male, female, age, range, something like that. But leave that just down to the end because it’s boring. Very important as well, explain why you’re doing this. Explain how their feedback will help. We are refurbishing our restaurant, we want feedback from our customers so that we give you experience our customers want. And your feedback will be essential. Offer a price, you’re going to offer something like a free meal for four. We will be giving away four, free meals for four to those who answer our survey by a certain date. You don’t want to give one to every person who applies, but give them something that make sure they’re encouraged to do it. Don’t ask ambiguous questions that could have two answers. So for example, if you took on that menu, don’t say, “Would you like us to add pizza and fish to our menu?” Some people might want pizza, some people might want fish, so ask, “would you like us to add pizza, would you like us to add fish?”. Don’t ask two questions at once. Don’t ask leading questions. Don’t say, “How would you rate our fantastic customer service?”. You’re already suggesting it as fantastic and you’re leading the answer. Ask them, “How would you rate our service?”, etcetera. Give them the option to have an awful, from excellent to awful. Don’t be worried about what people are saying. They’re already thinking about it. They’re already thinking in their minds, don’t stick your head in the sand. You need to know what they think. If they think it is, if some people think it’s awful, you need to address that. By the way, the question I’m suggesting, I’m just making up on the fly. They’re not necessarily the question you should be asking. So just the concept. Don’t ask open ended questions. That would require someone to answer alone with the long winded answer. The awful, when they don’t bother answering, so don’t say something like, “How could we improve our restaurant?”. That’s just pretty much impossible to answer, you’re not gonna get anything good out of that. You could say, “Which of these three restaurant, or give us your top three recommendations for improving our restaurant.” something like that. Or “Give us your top three food choices to add to our menu”. Give them something more exact but let them word it in their language. Also give them the option if it’s appropriate for another answer. For example, you might say, according to our records, you’ve not visited our restaurant for the last 6 months. Can you tell us why? You’re not going to be out to think of every single answer, so put on others and leave space for them to write an answer. Then when you’re asking the questions make sure the questions are going to be appropriate with the answers to the questions. They’re going to be appropriate to the result you’re looking for. What I mean is, is that the answers are going to help you provide a better solution. Don’t just ask them for the sake of it. If they’re not going to help you in your solution, in how you refer pressure. How you create that new menu, don’t bother asking. But at the end, one very sweet question you can ask is say, “Friends, if our restaurant was to become your most favorite ever restaurant, that you cannot stop telling all your friends about, what would it have to, what one element would it have to have to become that?”. Something like that, make sure again not open ended, don’t give them an essay. Try and say, “What two things, what one thing, what two things would it have?” But try and get them to give their opinion at the end. They’re into the swing just one more question. “What would make this perfect?” or “If you came along and design a restaurant menu, what would you put on it that would make it perfect?” Something like that. See how many people say the same things. Use survey monkey, use Google forms which comes in Google docs for free. These are all free, don’t need to pay. If you stop with how, you haven’t got enough customers, ask your friends. You’ve got emails, you’ve got friends, right? Contact your friends by email, sent them the survey and say, “Can you please fill this out for me, and do you know a couple other people I don’t have enough to sent it to. Do you a couple of other people that would be able to fill it out and will be out to give good answers? If you say, “please forward it” with the link, you will be amazed how many people will help you out. Don’t be shy. It doesn’t help. Get survey. Learn about your customers, learn about their languages, learn about what they want. Improve your business. 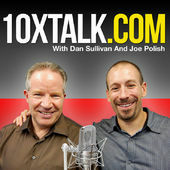 For today’s Drive Time Podcast recommendation, I am going to recommend Ten X Talk hosted by Dan Sullivan and Joe Polish. Dan Sullivan is famous as strategic coach. I’m a member of strategic coach along with tens of thousands of other people in the UK and North America. And Joe Polish is just Joe Polish. Genius network, I love Marketing, friend to make a people like reach your brand and etcetera, etcetera. And complete cleaning training system extraordinaire from marketing to everything. That Joe and Dan have known each other forever. Joe is a member of Strategic coach. Yes, still, despite everything he knows, still a member. They sit down, they discuss genuine business problems and genuine business solutions, it’s very very applicable to any business. I learn something every single time. Go have a look at 10xtalk.com the website and then check out the podcast in itunes and Stitcher. What questions do you need to ask your potential customers?